Home » Chef Recipes » Gluten Free Dessert Recipes » Gluten Free Brownies and Fudge » 17 Decadent Gluten Free Chocolate Desserts You Must Try! If you are a chocolate fan like I am, you will appreciate the fact that it is always a good time to indulge in some decadent gluten free chocolate recipes. There is just something about the way chocolate tastes when it hits your tongue that instantly makes you feel better. Each one of these delicious chocolate recipes will knock your socks off with how good they are! I recommend trying several of them and can’t wait to hear what you think! You feel almost sinful when you sink your teeth into these sweet desserts. I enjoy entertaining friends and family and at the end of our meal breaking out a chocolate treat that everyone loves. I can’t lie, it feels good when everyone is asking me for my recipes! Each one of these desserts has been made by me, and they are tried and true. I love them, my family loves them, and even my friends love them. Shopping for gluten free food is so much easier when you have time to plan ahead a little. Plus, if you are just starting there is a little bit of a learning curve. I have made a couple of guides to help you with shopping, and it won’t be so overwhelming. Gluten Free Costco Shopping Guide and The Ultimate Walmart Gluten Free Shopping Guide are full of very useful information. And definitely check out some of my popular Valentine’s Day Desserts if you want even more fun recipe ideas. I find that the easiest way to melt chocolate is in a double boiler. If you don’t have a double boiler you can put water in a saucepan and begin to boil, then place a glass bowl on top of the pan. Place the chocolate inside and continuously stir until melted. It can burn quickly if you aren’t careful. Never add a cold liquid like milk or butter to melted chocolate. If you add cold to the hot chocolate, it will cause it to seize, which results in a clumpy mess that is grainy and not too appetizing. Once in a while, you can save seized chocolate, but it doesn’t always work. Chocolate is also great for drizzling onto desserts. Just melt in the microwave at 10-second intervals and stir. Easy gluten free chocolate dessert recipes for every chocoholic! I had to save the gluten free chocolate mint flourless brownies for last because it is beyond amazing! Packed full of chocolate and the perfect explosion of mint will leave you feeling fulfilled. Serve with a spoonful of ice cream and hot fudge to take it to a whole new level.I love making this dessert in my mini cast iron skillets. The skillets just add to the overall presentation of this yummy treat. Plus, everyone likes to dig into their own skillet! 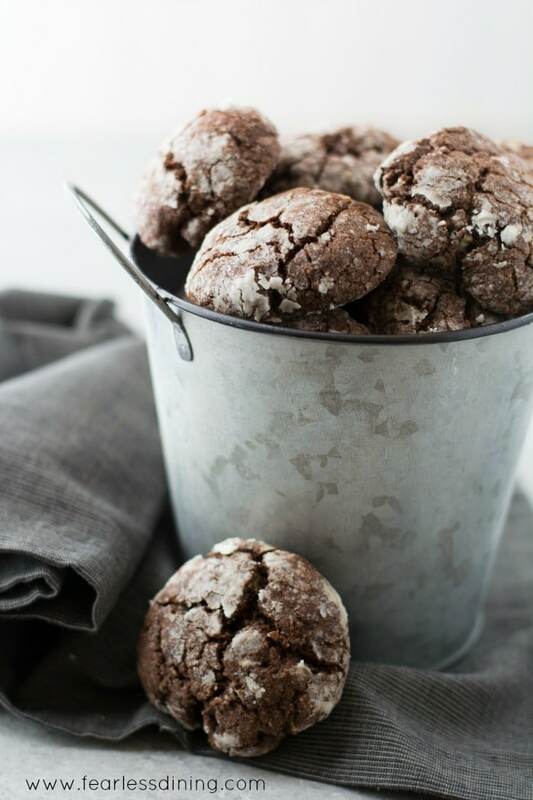 If you are a fanatic of all things chocolate and mint, then you have to try these gluten free chocolate mint crinkle cookies. Crinkle cookies have been around forever because they taste amazing, are super easy to throw together and they look adorable. Each cookie is moist, sweet and begging you to indulge in more! These chewy gluten free chocolate brownies are perfectly sweet, moist and delectable. I love to serve these when we have a dinner party or just any other day that you want to feel pampered. Each batch makes six nice sized brownies, and when you top them with ice cream they are out of this world! Simple Chocolate Truffles You Can't Pass Up! Here are some different ways you can make the most flavorful, rich chocolate truffles ever! Recipes like these truffles are great because you can adjust them and add several different flavors and textures. 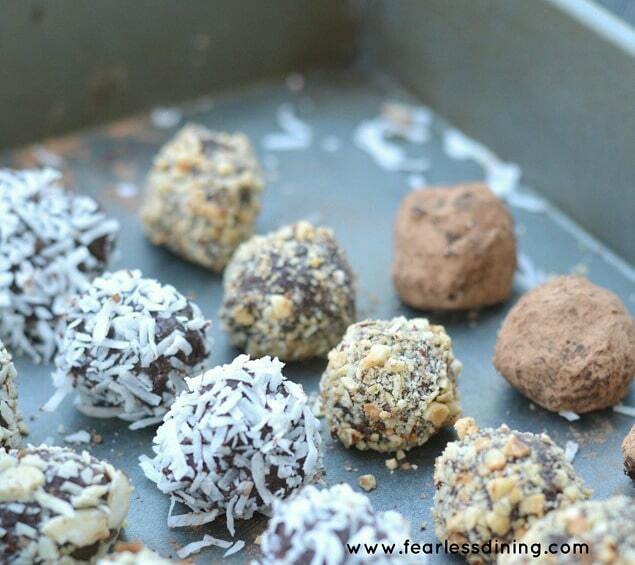 Add coconut, seeds, nuts, candies or sprinkles to make your truffles unique. This is also a fun dessert that even your kids will enjoy helping with too. 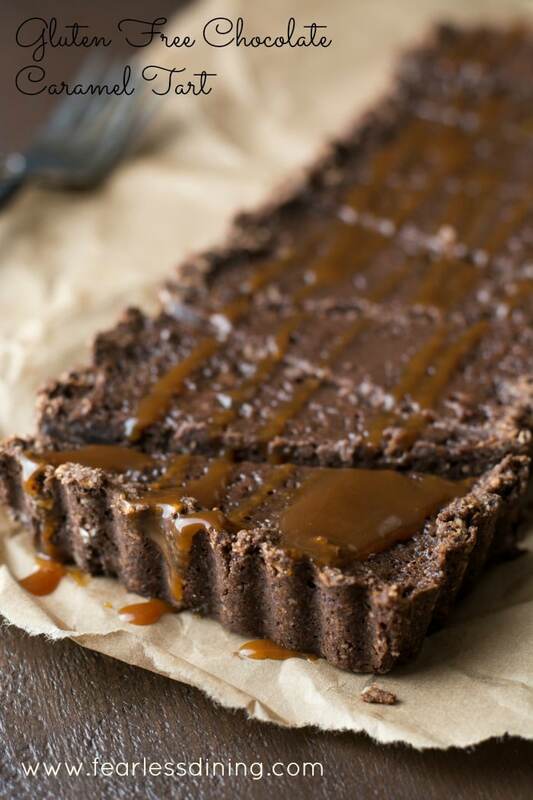 Chocolate and caramel flavors combine into a deliciously fancy chocolate tart. 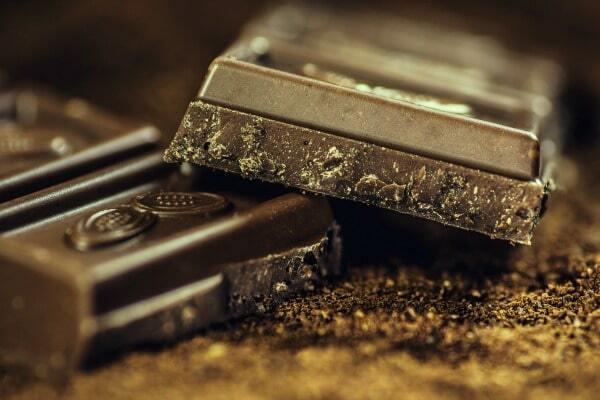 It is perfect for chocolate lovers! 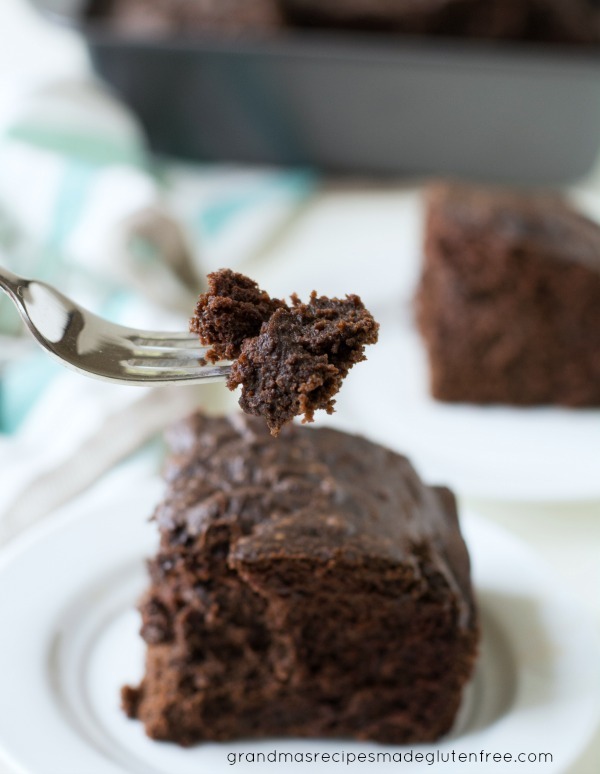 If you are looking for a moist gluten free devil’s food chocolate cake that has lots of rich flavors, then look no further! You can make this into a sheet cake or cupcakes. These make elegant cupcakes for baby showers, Valentine’s day parties or dessert. The combination of chocolate and peanut butter is something that I crave and can’t ever get enough of. This double chocolate peanut butter skillet cookie is the perfect example of a heavenly dessert! Plus, baking in a cast iron skillet adds to the texture and flavor of the cookie. 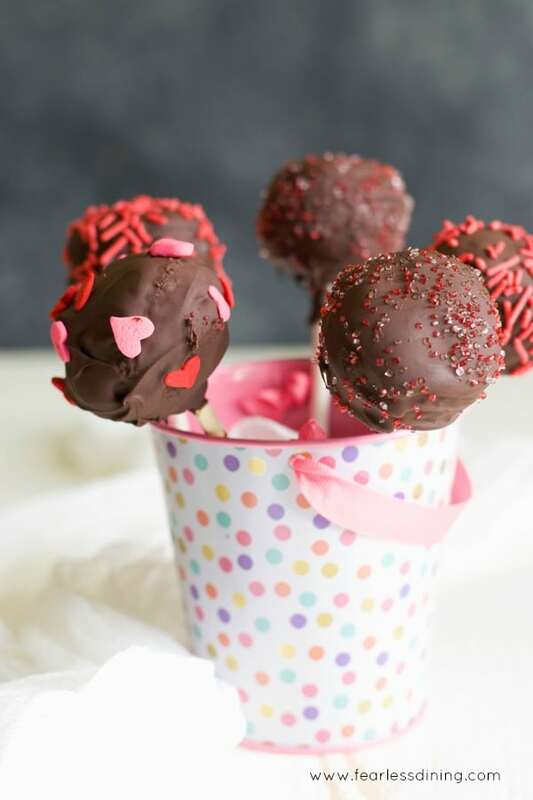 Gluten free chocolate cake pops are the ultimate party food in my eyes! It might because they are so adorable or because they taste so good that you just can’t get enough. Either way, whenever I make them everyone goes wild, and devours every last morsel. Serve them at your next dinner party for a charming dessert and your guests will love you! Rich, creamy, sultry dark chocolate custard is a home run in the dessert department. If you have never tried custard, then you have been missing out. I love how smooth it is, and the chocolate makes it out of this world delicious. If you are a chocoholic, then this is the recipe you have been waiting to treat your sweet tooth! I can not wait to tell you about this gluten free chocolate trifle! 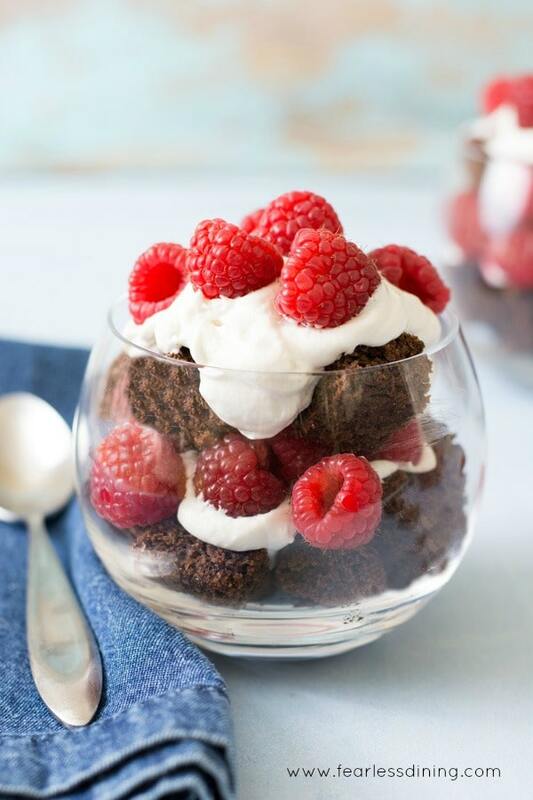 Every bit is filled with sweet ripe raspberries, whipped topping, and chocolate cake. I love to make these as a special treat or when I want a crowd-pleasing dessert. Besides, it is impossible to bite into this chocolate trifle without a smile on your face. You are missing out if you haven’t tasted the sweet goodness of this gluten free chocolate chip cookie dough fudge. When you are tight on time, no-bake desserts are terrific because they take so little time and effort.I typically make a double batch because I know there will not be a crumb left over. You can adjust this recipe and add in your favorite flavors like chocolate candies, marshmallows or nuts. If you are a cookie dough fan, this deliciously chocolaty edible cookie dough is for you. Dig a spoon in because this egg free dough is for eating! 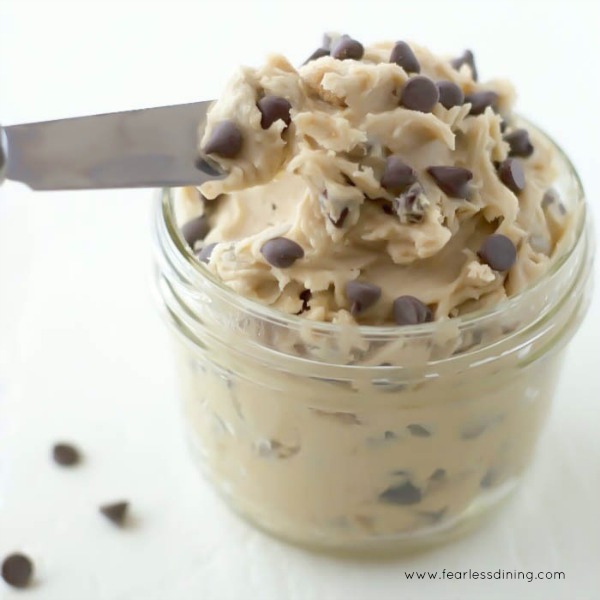 This deliciously creamy gluten free cookie dough is edible. Eat by the spoon full, or add a little extra butter so it makes a creamy frosting! 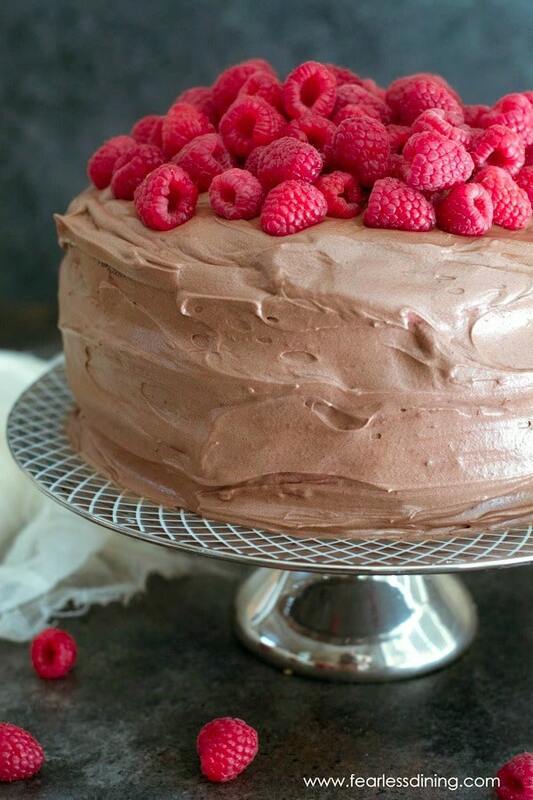 Your taste buds will explode when you bite into this gluten free chocolate raspberry cake! The moist cake, chocolate frosting, and ripe red raspberries are the perfect combination. You will seriously fall in love with this cake the minute it hits your tongue. 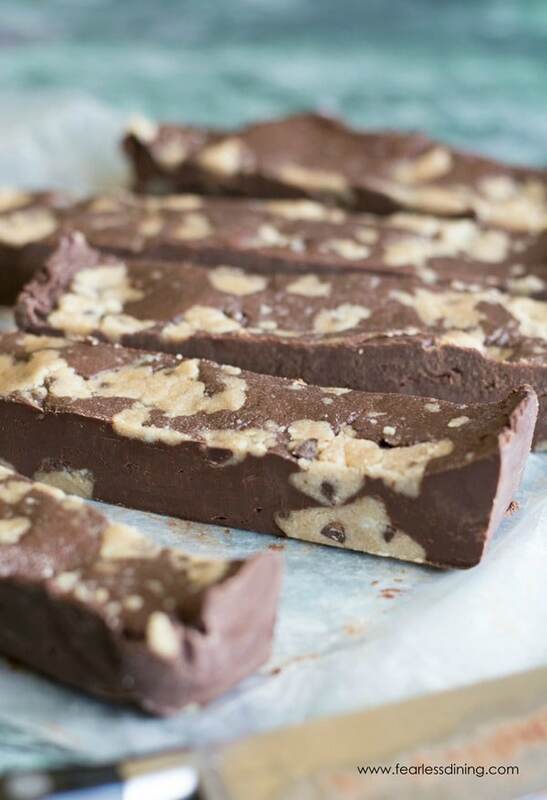 If you love chocolate and peanut butter, this chocolate peanut butter fudge is for you! Easy, no bake fudge makes great gifts too! This gluten free chocolate cake makes a delicious birthday cake, or use the batter to make gluten free chocolate cupcakes! 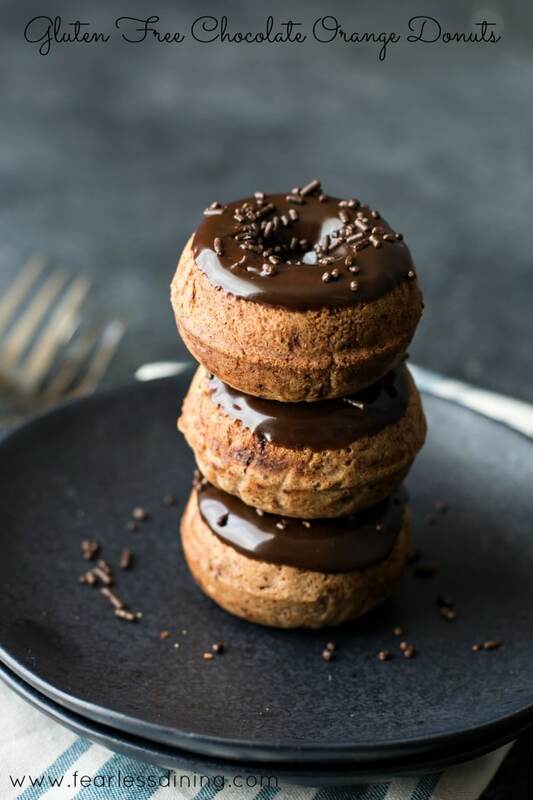 These gluten free chocolate donuts have a citrus flavored surprise. Coated in chocolate for chocolate lovers. 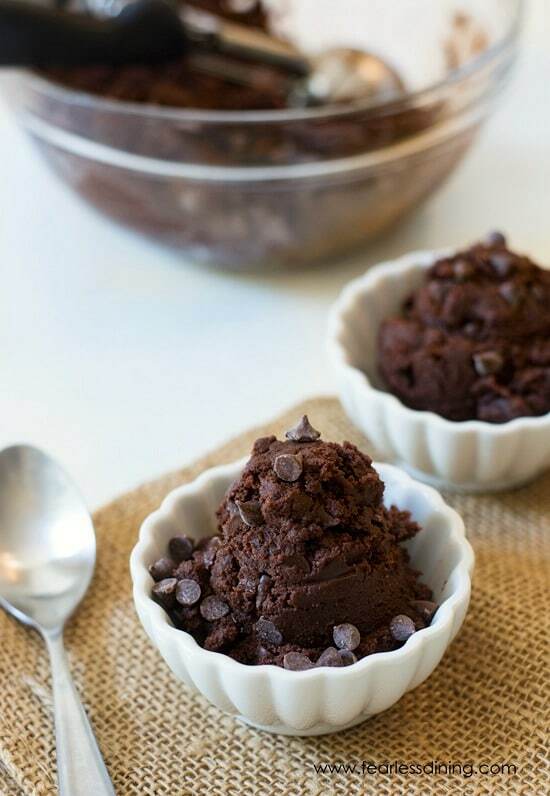 I hope you find some inspiration from these delicious gluten free chocolate desserts :-). Hi all the recipes look amazing! Is gluten free flour just wheat flour without the gluten? Are there other alternatives such as coconut flour? Hi Sharon, gluten free flour has no wheat. There are gluten free flour blends, that you would use if you are gluten free. Coconut flour behaves very differently than a gluten free flour blend. It absorbs a ton of liquid and wouldn’t work as a 1 to 1 replacement. If there is a specific recipe you are wanting to make, please send me an email at sandi@fearlessdining.com and I can try to help you.